I finally saw The Last Jedi so I’m now ready to get into pointless arguments about it with other Star Wars fans! Seriously, from the reactions I’ve seen online, this has been an especially divisive entry in the Star Wars series among fans. Some people absolutely loved it, and others totally hated it. As for myself, well, I guess I liked it. Yeah, yeah, it figures I would have an opinion that’s in-between those two extremes. Here is my semi-coherent review & analysis of the movie. As always, feel free to disagree. Whereas The Force Awakens was quite similar to the very first Star Wars movie, The Last Jedi is equal parts The Empire Strikes Back and Return of the Jedi. The Last Jedi opens with the Resistance, having successfully destroyed Starkiller Base, fleeing from their headquarters, with the vengeful forces of the First Order in hot pursuit. Meanwhile, on the remote planet Ahch-To, home of the very first Jedi Temple, neophyte Rey (Daisy Ridley) is attempting to convince the brooding, aged Luke Skywalker (Mark Hamill) to train her in the use of the Force. As the movie advances, Rey comes to believe that Kylo Ren (Adam Driver), the former student of Luke who has turned to the dark side of the Force, is still struggling with his conscience, and that it is possible to bring him back to the light. Rey turns herself over to the First Order, hoping to convince Kylo to switch sides, but he instead hands her over to the ancient, evil Supreme Leader Snoke, who is arrogantly confident that he will be able to break Rey. As well-executed a movie as The Last Jedi is, I periodically found myself rolling my eyes at just how brazen and shameless some of its sequences were in rehashing major elements from The Empire Strikes Back and Return of the Jedi. Look, I’m definitely environmentally conscious, but this is not the sort of recycling that I’m into! The Force Awakens was vague about whether Starkiller Base had destroyed the entire New Republic, or merely its capital. The Last Jedi, on the other hand, strongly implies that the New Republic has been totally obliterated, announcing the First Order is mere weeks away from gaining control of the entire galaxy. So only three decades after defeating Emperor Palpatine and restoring the Republic in Return of the Jedi, we are now right back where we started. A tyrannical dictatorship that is all-but-identical to the Empire has totally destroyed democracy, and nothing but a ragtag, outgunned group of freedom fighters stands between them and their final victory. In case you were curious, that loud sound of screeching tires that you just heard was the storyline doing a 180 and peeling off back in the opposite direction. In spite of Disney furiously stabbing at the reset button, The Last Jedi eventually did manage to surprise me. That was especially the case with Snoke. About two thirds of the way through The Last Jedi, Kylo brings Rey before Snoke. This very much felt like a remake of the throne room scene from Return of the Jedi, with the smug Snoke reeling off some reheated eeeeevil Emperor Palpatine dialogue, prodding Kylo to complete his journey to the dark side by murdering Rey. But then the entire sequence suddenly gets upended. Kylo uses the Force to activate Rey’s lightsaber from a distance, slicing Snoke in half, killing him instantly. Yeah, I definitely did not see that coming, since it felt like Snoke was being set up as the Big Bad of the entire trilogy. Kylo and Rey then fight side-by-side in a furious battle against Snoke’s elite guard, making a very effective team. It’s one of the best action sequences in the entire movie, even if Snoke’s guards do look like they’ve wandered in from a hockey rink. For a brief instant it really seems that Rey has succeeded, that she has managed to convince Kylo to turn his back on the First Order. But once again expectations are brutally subverted. Kylo is unable to let go of his anger and resentment. He has no interest in redemption, and intends to become the new Supreme Leader. The Last Jedi does offer a new perspective to Star Wars that is both refreshing and very timely… Men are hotheaded, macho idiots, and women are sensible, level-headed leaders who are much more capable of seeing the bigger picture. The movie is very much concerned with deconstructing the idea of the heroic male fantasy figure. One of the ways it does so is through its treatment of Poe Dameron (Oscar Isaac). During the opening scene, as the Resistance fleet attempts to flee their base, the hotshot Poe disobeys General Leia Organa (Carrie Fisher) to lead a counter-attack against the First Order’s massive Dreadnaught. Poe’s plan is successful, and the Dreadnaught is destroyed, but it is a pyrrhic victory, with much of the Resistance fleet also being wiped out. Poe, instead of being congratulated by Leia for what he sees as bold heroism, is demoted for his rash actions. Worse, the First Order then manages to track their quarry through hyperspace, and the now-diminished Resistance fleet, severely weakened after their assault on the Dreadnaught, is almost destroyed. Nearly all the Resistance’s leaders are killed and Leia is left in critical condition. Having not learned his lesson from this catastrophe, Poe immediately begins clashing with Vice Admiral Amilyn Holdo (Laura Dern). Poe is convinced that Admiral Holdo is incompetent. Still believing bold, immediate action is necessary, Poe authorizes Rose Tico (Kelly Marie Tran) and Finn (John Boyega) to embark on their risky plan to sabotage the First Order’s tracking device. Later, going so far as to accuse Holdo of treason, Poe leading a mutiny against her, only to finally discover that she had a plan after all, one that she understandably declined to share with the hotheaded pilot. Rey, Leia, Holdo, and Rose, the women of The Last Jedi, are the ones who refuse to give up hope, who keep fighting, who are flexible and adaptive, who think outside the box in order to attempt to find constructive solutions. Poe, Finn, Luke and Kylo, the men, are the ones who are impulsive and emotional, who are fixated on their hurt feelings, who find it difficult or impossible to break out of their rigid thinking and behaviors. In the two years since The Force Awakens came out there have been a lot of theories tossed around concerning Rey’s parents, and Finn’s parents, and the identity of Snoke. Some of these have been especially outlandish or bizarre. The Last Jedi once again subverts expectations by revealing that Rey’s parents are, in fact, no one in particular, and Snoke is just some guy. The movie doesn’t even bother to mention Finn’s parents, since in the end they are probably also no one we’ve ever heard of before. Considering how ridiculously interconnected certain Star Wars characters have been in the past, it’s actually refreshing to have some major characters who do not have a hidden parentage or an mystery alter ego. When he is reluctantly training Rey on Ahch-To, Luke tells her “The Force does not belong to the Jedi. To say that if the Jedi die, the light dies, is vanity.” And he is correct. Just as the Jedi do not have provenance over the Force, neither does one family such as the Skywalkers. Rey, we are told, is a nobody, coming from nothing and nowhere, but all that signifies is she achieves greatness not due to her parentage but solely by her own actions and beliefs. Luke Skywalker in The Force Awakens is a bitter, burned-out, mournful figure. He is weighed down by the consequences of his mistakes and hubris, and by the immense looses he has witnessed. He is a far cry from the enthusiastic, idealistic young man we once knew. However, in his own way, without quite realizing it, Luke is correct. The galaxy has moved on. Luke has failed to found a new Jedi Order because he was fixated on their ancient dogma, on recreating them as they had existed in the past. Luke’s opposite number, Snoke, is similarly afflicted with a blind desire to recapture the past. Snoke, in his attempt to position himself as the successor to Emperor Palpatine, with the First Order as his new Galactic Empire and Kylo Ren as his own Darth Vader, meets with failure and death, a victim of overconfidence and short-sightedness. The spirit of Yoda (Frank Oz) manifests itself to Luke on Ahch-To in order to tell him “The greatest teacher, failure is.” Luke, as well as the rest of the galaxy, must attempt to learn from their past mistakes in order to chart a new course forward. In any case, Mark Hamill does great work with the material he has been given, turning in a very strong performance. I found the scene between Luke and Yoda to be the most touching of the entire movie. It occurred to me that Yoda was, in his own odd way, the closest thing that Luke had to a father. Yes, Anakin / Vader was Luke’s biological father, but he was definitely not much of a parent, to say the least. Yoda was the one who, in the end, was there for Luke when it was most important, who decades later transcends mortality to return and teach his old student a message of hope when it was most needed. I was not impressed by Kylo Ren when he was introduced in The Force Awakens. I found him to be a whiny loser who desperately wanted to follow in Darth Vader’s footsteps. Well, he is still very much the same in The Last Jedi… but I’ve come to realize that this actually makes him a more plausible, believable villain. This is also true of General Hux (Domhnall Gleeson), a strutting, self-important figure whose smug arrogance masks his incompetence. In real life, dictators and criminals are not suave, coolly sinister, grandiose figures of menace. In fact, more often than not they are petty, insecure, paranoid and jealous. They are driven by fear and inferiority, by a need to compensate for their own weaknesses. Their grotesque ambitions are often overcompensation for their inner failings, a futile attempt to fill the empty void within themselves that they are desperate to deny exists. Kylo Ren and General Hux are both small men. They lash out at anyone and anything they perceive as a threat to their well-being and self-image. They are concerned with themselves and no one else. Kylo and Hux demonstrate that evil is not awesome or badass, but sad and lonely. My girlfriend Michele offered an interesting political reading of The Last Jedi. The First Order, supported by greedy, immoral corporate entities, has set out to crush freedom & liberty in the galaxy. The Resistance is dedicated to stopping them, but it is nearly crippled by internal conflict. Kylo Ren is a selfish, oversensitive, short-tempered, petty man-child who lashes out at the world. Vice Admiral Amilyn Holdo is an experienced, intelligent leader who unfortunately has a difficult time being warm or relatable to the people under her command. Poe Dameron is an impulsive hothead who wants immediate results, who doesn’t have the patience to consider the long-term picture and who is condescending towards the established command structure, undermining the decisions of his superiors. In other words, the First Order is the Republicans, the Resistance is the Democrats, Kylo Ren is Donald Trump, Amilyn Holdo is Hillary Clinton, and Poe Dameron is Bernie Sanders? That is certainly one way to interpret the movie. One of the few sources of comedy in the otherwise-grim The Last Jedi are the Porgs, the adorable, wide-eyed birds who inhabit Ahch-To, and who stow away on the Millennium Falcon, much to Chewbacca’s consternation. The Porgs work really well because they are basically just set dressing. The cute critters are not used to drive the plot, or to resolve any crises. There just there to occasionally lighten the mood in a very dark story. If you don’t like them then you can basically just ignore them, and if you do like them then they serve to provide a little bit of comedy that offsets the intense drama. The Vulptex, aka crystal foxes, on Crait are also interesting, with a distinctive visual. Again, they really aren’t there to advance the story, except in cluing in the Resistance on how to escape from their cave headquarters after the First Order show up, and they also add some local color to the final act. 11) Where Do We Go From Here? The Last Jedi ends with the Resistance down to a handful of survivors fleeing in the Millennium Falcon, with the First Order now in the incompetent yet very dangerous hands of Kylo Ren. The implicit message of the movie’s last scene is that the Resistance will find new strength in the young children of the galaxy who have suffered under the injustices perpetrated by both the First Order and the war profiteers of the galaxy’s military-industrial complex. Nevertheless, it seems like there’s a lot that needs to be addressed in the next installment. That task is made all the more difficult by Carrie Fisher’s untimely death. As I understand it, Leia was being set up to be a central figure in the conclusion of this trilogy, and I don’t envy the makers of Episode IX having to write around her enormous absence. On the whole Rian Johnson did a pretty good job writing & directing The Last Jedi. It was an entertaining movie with exciting action sequences. It also presented some interesting and thought-provoking ideas, although it really didn’t spend enough time examining most of them, instead rapidly moving on to the next action piece. The movie also did a fair job at developing some of the characters, particularly Rey, Poe Dameron and Kylo Ren, and in introducing the tough & likable Rose Tico. I just wish that all of this could have been achieved within a story that was not such a retread of previous installments, and that relied so heavily on the formula established in the original trilogy. The Last Jedi is definitely an improvement over The Force Awakens, but it still falls short of Rogue One, which was successful at both presenting a fresh perspective on a familiar universe and at telling a very different sort of story. The new Star Wars movie Rogue One was enjoyable. While I liked The Force Awakens, I nevertheless felt that Disney played it very safe with their first installment since acquiring the franchise. Rogue One, in contrast, does attempt to stretch out in different directions. Rogue One reveals how the Rebel Alliance stole the plans for the Death Star from the Empire. Despite the fact that it is set immediately before the events of the very first Star Wars movie, Rogue One successfully expands what previously felt like well-explored territory. The protagonist of Rogue One is Jyn Erso (Felicity Jones) a woman in her early twenties who has spent most of her life on the run from the Empire. When she was only a child Jyn’s mother was killed, and her father, scientist Galen Erso (Mads Mikkelson), hauled off to work on the construction of the Death Star by the ambitious Krennic (Ben Mendelsen). Jyn is recruited at gunpoint by the Rebel Alliance, which hopes she can lead them to her father. Grim, brooding Intelligence officer Cassian Andor (Diego Luna) and his reprogrammed Imperial droid, the sarcastic K-2SO (Alan Tudyk), are assigned to accompany Jyn in tracking down Galen. Rogue One has been described as the darkest entry in the series since The Empire Strikes Back. While I think some people are overlooking Revenge of the Sith, which was hardly a laugh-fest, the point is that Rogue One is a very gritty movie by the standards of the franchise. Whereas the original trilogy focused on the main figures of the Rebel Alliance, this is the story of the men and women fighting in the trenches against the Empire. Yes, they are motivated by the idealism of the Alliance, but after long years of conflict they are also driven by ruthless pragmatism. When we are introduced to Cassian Andor, he is meeting with an informant, who tells him of a defecting Imperial pilot in possession of a message from Galen Erso. Unfortunately Andor and his informant are discovered by Stormtroopers. To prevent the Empire from learning about the existence of the defector, Cassian, showing little hesitation, shoots his informant in the back and flees. As ruthless as Cassian can be, he is positively tame compared to Saw Gerrera (Forest Whitaker) a militant member of the Rebel Alliance. Having spent nearly two decades fighting against the Empire, Gerrera is scarred, physically and mentally, consumed by paranoia. His followers utilize guerilla tactics, launching attacks against Imperial forces in heavily populated areas. Jyn Erso is, in a way, a reflection of Luke Skywalker. In the opening scene Jyn and her parents living on an isolated farm, in hiding from the Empire. There are definite similarities between this and how we first met Luke in A New Hope. We even see Jyn’s mother with a glass of blue milk! Luke, of course, was bored by the uneventful life of a farmer, and yearned for adventure. He couldn’t wait to leave and explore the galaxy. Jyn, in contrast, spent a decade and a half scrambling about the galaxy, afraid and alone. Instead of craving excitement, she yearns for safety and normality. Having seen her mother gunned down by Stormtroopers and her father dragged off in chains, she would no doubt give anything to regain the quiet life on the farm she once shared with her parents. It was nice to see a few familiar faces in Rogue One. Jimmy Smits returns as Bail Organa, a role he originated in the prequels. Genevieve O’Reilly once again portrays Mon Mothma. Nearly all of her scenes from Revenge of the Sith ended up on the cutting room floor (although they later appeared as extras on the DVD) so I’m glad she got some actual screen time here. C3PO pops up long enough to utter one of his characteristic complaints. Darth Vader also appears, once again voiced by James Earl Jones. Via unused footage from the first Star Wars movie, Rebel pilots Red Leader and Gold Leader both participate in the Battle of Scarif. Saw Gerrera is actually a character who originated in the Clone Wars animated series, and Forest Whitaker is set to voice him in upcoming episodes of the Rebels series, which is set a few years before this movie. Speaking of Rebels, there is also a brief glimpse of grumpy astromech droid Chopper, and The Ghost is part of the Alliance fleet. A contentious element for some fans was the recreation of Grand Moff Tarkin via digital effects. I felt that this started off quite effectively, but the more scenes that Tarkin appeared in, the more artificial he appeared. It is understandable that Tarkin, who was originally played by Peter Cushing, had to be included in Rogue One in some capacity. His omission would have been rather glaring, given his position as the commander of the Death Star. Perhaps it would have been better to have used him in less scenes, or in a couple of instances have him communicate with his subordinates via hologram transmission. I have heard, however, that casual viewers, people who were not huge Star Wars fans and who hadn’t seen the original movie in a number of years, did not realize that Tarkin was a digital effect. That makes sense. If you go in knowing that Peter Cushing passed away back in 1994, of course you’re going to focus on how realistic Tarkin appears in Rogue One. But if you don’t really remember the character from the first movie, you’re probably not going to pay as close attention. In the final seconds of Rogue One we also see Princess Leia, looking as she appeared in A New Hope, via a digital recreation of a young Carrie Fisher. It is such a brief shot that the movie just about pulls it off. Darth Vader is one of those characters who I have often felt is best used sparingly. He is such an iconic figure that overexposure both decreases his menace and results in fuel for parody. I think it was a mistake for Marvel to publish an ongoing monthly Darth Vader comic book series. Vader has two short scenes in Rogue One, and as result has much more of an impact. He first appears about halfway through the movie, with Krennic showing up at the Sith’s fortress to voice his anger at his authority being usurped by Tarkin. An impatient Vader abruptly dismisses Krennic’s complaints, sending him on his way. We don’t see Vader again until the very end of the movie. The Rebel fleet has received the Death Star plans and are about to retreat from Scarif when Vader’s star destroyer abruptly emerges from hyperspace, attacking them. Boarding the Alliance flagship, Vader attempts to retrieve the plans, brutally cutting his way through the Rebel soldiers. He is a terrifying, seemingly-unstoppable figure. It was the first time since I was a little kid that I found Vader to be genuinely scary. Unlike some Star Wars fans, I never really saw the Empire seemingly overlooking the exhaust port in the Death Star as a glaring plot hole. It’s very obvious from the final battle in the original movie that the exhaust port is heavily defended, and scoring a direct hit on it is nearly-impossible. Nevertheless, over the years various people have complained “How can the Empire have missed such a huge vulnerability in their giant planet-destroying weapon?! ?” Rogue One provides an answer. Galen Erso realized that whether or not he assisted the Empire in building the Death Star, sooner or later they would find someone who could get the battle station to function properly. So he pretended to be browbeaten into submission by Krennic and went to work on the Death Star, which enabled him to sneak a weakness into it: the exhaust port. Not only is this a nice explanation, it also adds an extra dimension to Galen, revealing that he never completely gave up defying the Empire, that he saw his forced servitude as an opportunity to subvert them from within. 8) This Issue: Everyone Dies! Going in to Rogue One, I was half-expecting that most, if not all, of the new characters would die. After all, none of them were ever seen or even referred to in the original trilogy. On the other hand, there was a part of me that really didn’t think that Disney would pull the trigger, and at least a few of the Rogues would escape to fight another day. But, no, they all die. No cheats, no last-minute reprieves, no cop-outs. Jyn, Andor, and everyone else die in the Battle of Scarif, all of them sacrificing their lives to transmit the Death Star plans to the Alliance fleet. You might think that a movie with such a foregone conclusion would be a bit dull. Of course the Rebels are going to steal the Death Star plans; anyone who’s seen A New Hope knows that! Rogue One, however, is so well done that I nevertheless found myself constantly on the edge of my seat. Gareth Edwards does an amazing job directing the movie, making it an exciting, riveting experience. There are times when Rogue One’s reach exceeds its grasp. During the first 15 minutes the narrative jumps all over the place, switching between different characters on different planets, leaving me somewhat confused. Several of the characters also felt underdeveloped. Saw Gerrera feels like he’s being built up to have a major role, only to suddenly get killed off halfway through the movie. We aren’t given any real insight into why Imperial pilot Bodhi Rook has decided to defect to the Rebellion, other than he was somehow inspired by Galen. Two of the Rogues, Chirrut Imue and Baze Malbuus are interesting characters, but we get very little background on them. Jyn could also have used more development. She spends the first half of the movie very reluctantly working with the Rebels, but in the second half she has suddenly become the loudest voice in attempting to galvanize the Alliance to fight against the Empire. Yes, Jyn has seen the Death Star in operation up-close, and she also doesn’t want her father to have died in vain. But it still feels like a rather abrupt jump from one position to the other. The movie could have done a slightly better job at explaining how she came to change her mind. The Rebel Alliance that we see in this movie is a very diverse group, made up of cultures and species from numerous worlds. Unfortunately that means they have varying viewpoints and agendas, and as a result are often working at cross-purposes. They all seek the same ends, stopping the Empire, but they disagree on the means. Mon Mothma is hoping for a political solution to the injustices perpetrated by the Empire; she wants Cassian and Jyn to rescue Galen so that he can provide testimony about the Death Star to the Imperial Senate. That mission is immediately, and secretly, countermanded by General Draven, who pulls Cassian aside and orders him to assassinate Galen. Other members of the Alliance, learning of the Death Star, are ready to capitulate, believing that they have no hope of winning. And then there is Saw Gerrera, who is labeled an “extremist” by the rest of the Alliance, a man who dismisses his former colleagues as too moderate and ineffectual. On the other side is the Galactic Empire. In spite of the individual ambitions of men like Tarkin and Krennic, the jockeying for influence, in the end they all share the same goal: the subjugation of the galaxy through force and terror. Whatever their individual aspirations, they are nevertheless ready to work with colleagues who they may dislike for the promise of great power. The members of the Empire are unified in their ambitions for control over others and their willingness to embrace utter ruthlessness. It does not matter how noble the Rebels may be, how lofty their goals are. Until the various factions that make up the Alliance set aside their differences, resisting calls for ideological purity, they remain unable to fight the monolithic Empire. It is only at the end, when the Rebels are unified on a common course of action, working together to achieve their goals, that they are finally able to become an effective opposition against the Empire’s tyranny. Michele and I went to see Star Wars: The Force Awakens on Thursday evening. We both wanted to go ASAP in order to avoid the inevitable spoilers that would soon be proliferating the Internet. What did I think of it? Short answer: I liked it. Long answer: read the rest of this review. Be advised: there are MASSIVE SPOILERS. If you have not seen the movie yet and do not want it ruined for you then do not proceed any further. In many ways the set-up of The Force Awakens is similar to the original trilogy. Thirty years after the events of Return of the Jedi, the remnants of the Empire have reorganized as the fascist First Order. Opposing them is the Resistance, a movement made up of both veteran members of the Rebel Alliance including General Leia Organa (Carrie Fisher) and a younger generation of freedom fighters. The Republic has begun to reform and is providing backing to the Resistance. Both the Resistance and the First Order are attempting to locate Luke Skywalker (Mark Hamill), who vanished years before. Elsewhere in the galaxy, Han Solo (Harrison Ford) and Chewbacca (Peter Mayhew) have gone back to smuggling. Due to personal tragedy, Han is once again a man who wants no part of any noble cause. He’s looking to stay as far away from the war between the Resistance and the First Order as possible. However, once again, despite his wishes, Han and his Wookie best friend are reluctantly drawn into the conflict. Writer / director J.J. Abrams and co-writers Lawrence Kasdan & Michael Arndt introduce several new characters in The Force Awakens. BB-8 contains part of a map Poe located, a guide to Luke Skywalker’s location. Rey and BB-8 soon encounter Finn (John Boyega), a young Stormtrooper who defected from the First Order and helped Poe escape. Crash-landing on Jakku, Finn is separated from Poe. Looking for a way off the barren planet and away from the First Order, Finn joins Rey in attempting to return BB-8 to the Resistance. On the opposite side of the fence, the First Order’s efforts to locate BB-8 are spearheaded by Kylo Ren (Adam Driver), a practitioner of the Dark Side of the Force. Accompanying him are the ruthless General Hux (Domhnall Gleeson) and armored officer Captain Phasma (Gwendoline Christie). Ren and Hux report directly to the Supreme Leader of the First Order, the mysterious Snoke (Andy Serkis), who only appears as a hologram. Abrams, Kasdan and Arndt do a good job introducing the new heroes in The Force Awakens, making them compelling characters. I definitely became very interested in Rey, Finn and Poe as the movie progressed. The fact that Ridley, Boyega and Isaac all turned in solid performances certainly helped to sell this next generation to me. I did think Finn had a few too many humorous “Aww yeah” lines of dialogue. You would think someone raised by a militaristic dictatorship might be a bit more socially awkward and have some trouble coming up with snarky remarks. There’s also the breakout “star” of the movie, namely the droid BB-8, who looks across between R2-D2 and a soccer ball. The SFX and sound people gave him a fun, mischievous personality. Wisely, much of the movie was devoted to introducing these new heroes. Other than Han and Chewbacca, all of the original trilogy characters have small roles. That was a good way to establish ties to the previous movies without overshadowing the new characters. Ford and Ridley definitely work well together, as we see the world-weary, mournful Han begin to once again lower his guard and become something of a reluctant father figure to Rey. On the other hand, the villains Hux and Phasma are both very one-dimensional and don’t have too much screen time. Well, most Star Wars antagonists are unfortunately underdeveloped, so this is not too surprising. And then there’s Kylo Ren, aka Ben Solo, the son of Han Solo and Leia Organa. He reminds me of a brooding Goth teenager who wants everyone to take him seriously. Ren idolizes Darth Vader and wants to follow in his footsteps. One gets the impression that the reason why Ren wears a sinister black mask with a voice modulator is because he is so desperately attempting to emulate Vader. And if you thought Vader had a short fuse, well, Ren is worse. Something goes wrong, next thing you know he’s furiously hacking up equipment with his lightsaber. I don’t know how the heck the First Order can afford a weapon like the Starkiller if they have to repair all the property damage caused by Ren! It appears that Ren’s weakness as villain is actually deliberate. Han Solo suggests that to Ren that Snoke regards him as nothing more than an easily manipulated pawn that can later be discarded. Certainly Ren would not be the first hotheaded bully attempting to mask an inferiority complex with a façade of strength. In the past I touched upon a question occasionally asked by fans, namely who would actually want to work for the Empire. That query is especially raised in regards to Stormtroopers, who appear to have the most thankless job of all, typically serving as cannon fodder. The Force Awakens addresses that particular question, and the answer is very unpleasant. Stormtroopers are conscripts who are kidnapped while only infants, who are then indoctrinated with the ideology of the First Order throughout their childhoods, emerging as adults who mindlessly follow the orders of their commanding officers. Finn was one of these children. In fact, Finn isn’t even his real name. All he knows is his serial number, FN-2187. The capture of Poe on Jakku is his first mission in the field, and despite years of brainwashing FN-2187 is shocked at the slaughter of innocents. Horrified at what the First Order is doing, FN-2187 helps Poe escape from them. It is the Resistance pilot who gives him the name “Finn” after the letters in his First Order ID. There are real-world analogies at play here. Over the decades various totalitarian governments have utilized this technique, such as the various Communist regimes of the mid-20th Century. More recently various terrorist groups like Boko Harem have kidnapped large numbers of children to mold into future members. At one point in The Force Awakens there is an assembly of First Order military forces that is very reminiscent of the infamous Nuremberg Rallies , with General Hux delivering a chilling Hitler-esque rant against the Republic. The original trilogy drew a few parallels between the Empire and the Nazis, but this is far and away the most obvious evocation of the Third Reich’s evil in the Star Wars universe. Seeking to outdo the Empire, the First Order has created an even more insanely dangerous superweapon. Instead of a moon-sized battle station, the First Order transformed an actual planet into the Starkiller (no doubt a nod to George Lucas’ original name for Luke Skywalker in the early drafts of Star Wars). Rather than merely destroying nearby worlds, Starkiller can obliterate multiple targets on the opposite end of the galaxy. The Starkiller is also a hell of a lot more fortified than the Death Star. Even after Finn provides the Resistance with the location of the Base’s obligatory weak point, destroying it still proves to be an almost-impossible task. Sorry, but Snoke is just too ridiculous a name for a character who is supposed to a dark, menacing villain. Yes, I know, nearly all Star Wars character names are strange: Obi Wan Kenobi, Boba Fett, Mace Windu, Padme Amidala, etc. But most of the time George Lucas devised names that were odd but still cool. Snoke just sounds goofy. I mean, that’s a character from a mid-1980s Saturday morning cartoon, right? No, wait, those were Snorks. Never mind. Michele expressed the opinion that The Force Awakens was much better than the prequels, stating “They made the movie that the fans wanted.” I responded that the prequels were better than most people give them credit, and that sometimes it is not a good idea to give the fans exactly what they are asking for. Appearances by a whole bunch of the original trilogy characters? Check! A ragtag group of freedom fighters struggling against a monolithic adversary of pure evil? Check! A massive superweapon that can destroy entire planets? Check? A hero who grows up on a desert world and who discovers that it is her destiny to embrace the Force and become a Jedi? Check! Another hero who is concerned with self-preservation but who gradually comes to believe in a cause bigger than himself? Check! As I’ve observed before, the prequels were flawed, but they were still enjoyable. What Lucas really, REALLY needed to have on those three movies was a strong co-writer on the screenplays, someone like, well, Lawrence Kasdan, who previously worked on The Empire Strikes Back, Raiders of the Lost Ark and Return of the Jedi. I expect that the reason why the dialogue in The Force Awakens is so well written is due to Kasdan’s involvement. Because of weak scripts, as well as the fact that Lucas was attempting to tell a story that was somewhat different from the original trilogy, the prequels were not well received by many. Imagine a scenario where you enjoy a new music group because they do amazing cover versions of old songs that you love. In fact, you like this new group even better than the more recent work of the original artists, whose later albums weren’t as well written, and who no longer can hit the high notes as often, or play the guitar as fast. That’s sort of how The Force Awakens came across to me, as J.J. Abrams doing a cover album of Star Wars Greatest Hits. But the thing is, no matter how you play around with the material, tweaking it, speeding it up, emphasizing certain things over others, no matter how fantastic it turns out, at its core are still the same notes & lyrics Lucas wrote over three decades ago. As I said, Star Wars: The Force Awakens is a fun, well-made movie. It is also a movie that plays it very safe. Obviously Disney was not going to allow anything too experimental or offbeat on their very first Star Wars movie. I hate to think that they are going to require the entirety of the franchise to remain so formulaic. Hopefully in the future, in some of the spin-off movies that are in the works, Disney will let the directors & writers strive for a different tone and go in new directions. We shall have to see. Welcome to the seventh edition of Super Blog Team-Up! This time, to celebrate the release of The Force Awakens, all of the participating bloggers will be writing about various aspects of the Star Wars phenomenon. This ties in very well with what I’ve been doing on my own blog. For the last few months I’ve been writing reviews of my favorite entries in the Star Wars expanded universe. For my contribution to SBTU 7 I’m glancing through the Star Wars theme sketchbook that I started in 2003. In the last 12 years I’ve obtained incredible sketches & commissions from a number of very talented artists. There are so many great pieces that I had genuine difficulty deciding which ten I should include here. I would have featured more, but then this post would have been much too long! June Brigman has a charming style to her work that I have always enjoyed. With her husband Roy Richardson she illustrated the Star Wars miniseries River of Chaos which featured Princess Leia. June also did a cute trading card of Leia with the Ewoks for the first Star Wars Galaxy set from Topps. She’s also drawn illustrations for a few SW young adult novels. It was an obvious choice to ask June to draw Princess Leia in my sketchbook. She did a really wonderful job! The backgrounds on this commission remind me a bit of the SW work of legendary artist Al Williamson. Tony Salmons penciled “Wookiee World,” issue #91 of the original Marvel SW comic book series. At first I was going to ask Salmons if he’d draw Chewbacca. But I thought Salmons might prefer to tackle another character. I asked him who else he’d enjoy drawing. He suggested Boba Fett. That was a great idea. Salmons had a lot of fun drawing the bounty hunter, and it shows. I love that “ZAT” sound effect. Rich Buckler has a very bold style, influenced by Kirby. I thought Buckler he’d be perfect to draw either of the action heroes from the first movie, namely Han Solo and Luke Skywalker. I asked Buckler who he’d prefer, and he immediately chose Han. Buckler did an amazing job at capturing Harrison Ford’s likeness. Buckler’s only published Star Wars art was the Lando Calrissian trading card he drew for the Galaxy series two set from Topps. That’s definitely unfortunate. This sketch shows that he’s perfectly suited to the material. I would really enjoy seeing him do further SW work. Michael Kaluta previously did an imaginative rendering of Ackbar for the first Star Wars Galaxy trading card set. When I began this sketchbook, I hoped to eventually have Kaluta draw that character. Kaluta was generous enough to agree to it, with impressive results. Note that he rendered Ackbar’s pupils in pencil to convey a watery, “fish-eye” look. It’s that attention to detail that makes Kaluta such an incredible artist. I suppose you can lay the “blame” for this one at the feet of fellow Star Wars sketch collector John Higashi. He obtained a nice sketch of Tarkin from Gotham Central artist Michael Lark. When I later met Lark at a convention I asked him if he would be willing to draw that character again. Lark felt it would be more fun to draw one of the Sand People on a Bantha, and asked me if that was okay. I decided to let him go for it, and Lark produced this very impressive illustration. It’s interesting to see Lark, who often works on noir-themed stories, illustrate sci-fi material. Guy Dorian saw a scan of a Star Wars sketch his brother Ian had done for me, and he e-mailed to say he wanted to contribute one too. Guy told me that he’d worked on a SW coloring book several years earlier, and so had drawn a number of the characters before. A few months later at the next Big Apple Comic Con, I stopped by Guy’s table with my sketchbook. Guy told me he was interested in drawing Yoda. He spent a fair amount of time working on this. As you can see, there’s some very detailed linework to this piece. Paul Azaceta was at the 2007 New York Comic Con to promote the release of the trade paperback collection of the Grounded miniseries he drew for Image Comics. He was also doing a lot of sketching at the show. An incredible drawing of Johnny Depp from Pirates of the Caribbean that was sitting on his table immediately caught my eye. Seeing that, I asked Azaceta if he’d be able to draw something in my SW sketchbook. He agreed, and produce this stunning rendition of the malevolent Emperor. I saw Jan Duursema at the November 2002 Big Apple show where she was drawing some amazing convention sketches of Star Wars characters. That was what inspired me to start this theme sketchbook in the first place. One of my goals was to get a sketch by Duursema. Well, it took some time, but I finally met her again at the 2009 New York Comic Con. I asked Duursema to draw Aayla Secura, the very cool character she created with John Ostrander for the Dark Horse comic books. Fortunately, I just managed to get onto Jan’s sketch list, and she drew this on Sunday afternoon. It turned out great. So, yes, it was worth waiting six and a half years for this after all. Jodi Tong is a talented artist with a really fun style. Every time I get a new sketch from Jodi it’s inevitably better than the last one. She did an amazing job on this drawing of Shaak Ti, one of the Jedi from the prequels who was featured prominently in the Dark Horse comics. There’s so much detail to this piece. I’m hopeful that I’ll have an opportunity to obtain more sketches from Jodi in the near future. I hope everyone will check out Comic Art Fans to see the rest of my Star Wars sketch collection. There are some really great pieces. Over the past few months I’ve been doing something of an informal countdown to The Force Awakens on this blog, reviewing some of my favorite Star Wars spin-offs. Today I’m looking at Shattered Empire, which was released in October by Marvel Comics. Confession time: I haven’t been following the Star Wars comic books since they returned to Marvel, mostly because I’ve gotten the impression that they suffer from an extremely decompressed style of storytelling. But I decided to get Shattered Empire since it was a four issue miniseries and it was released on a weekly basis. That meant I’d have the entire story in hand very quickly. I waited until all four chapters were released and read it in one sitting. Oh, yes, according to the indicia, the full title of this miniseries is Journey To Star Wars: The Force Awakens – Shattered Empire. What a mouthful! I’m just going to call it Shattered Empire for simplicity’s sake. Shattered Empire is billed as a canonical prequel to the events of The Force Awakens. Writer Greg Rucka and artist Marco Checchetto examine how events unfolded across the galaxy in the weeks and months following Return of the Jedi. We see these developments through the eyes of Lieutenant Shara Bey, aka Green Four, a pilot in the Rebel Alliance, and her husband Sergeant Kes Dameron, a commando in Han Solo’s strike team. The Battle of Endor was undoubtedly the Alliance’s greatest, most important victory yet. Both Emperor Palpatine and Darth Vader were killed, and the second Death Star was destroyed. However, as we see in this miniseries, this was not the end of the struggle against the Empire. I was only seven years old in 1983 when Return of the Jedi came out. Even at that young age I briefly questioned if this really did mark the end of the Empire. Yes, I was obviously too young to comprehend such concepts as the difficulties in dismantling the remnants of a vast dictatorship, the challenges of establishing a stable democratic government, and the likelihood of ruthless opportunists taking advantage of the sudden vacuum of power. Nevertheless I distinctly remember thinking that much of the Imperial fleet at Endor apparently survived the battle, and it seemed odd to me that they would all surrender. As we see in Shattered Empire, there are indeed Imperial forces throughout the galaxy that have no intention of relinquishing power. Their defiance is spurred on by none other than Palpatine himself. Master chess player that he was, the Emperor left in place a deadly contingency plan to be implemented in the event of his demise. Via technology and loyal agents, many of the Empire’s officers are convinced that Palpatine still lives. They are given orders to implement Operation: Cinder, the total devastation of numerous inhabited worlds. Clearly the Emperor intended that if he couldn’t have the galaxy then no one would. Shara and Kes’s elation at the victory at Endor, their optimism for the future, gradually gives way to weariness and despair, as the promised end to hostilities fails to materialize. Instead the couple is forced to face the possibility that they will have to spend the rest of their lives fighting against an adversary that is unwilling to capitulate. I’ve enjoyed Greg Rucka’s work in the past on Whiteout, Queen & Country and Gotham Central. He is definitely good at writing interesting, well-rounded characters. Certainly he does a fine job developing Shara Bey. She is a welcome addition to the Star Wars universe. Her husband Kes Dameron is given somewhat less “screen time,” and is consequently not explored nearly as much. Nevertheless, given the requirements of fitting such a large amount of material within four issues, Rucka succeeds at establishing both characters. One of the subplots in Shattered Empire involves Princess Leia and Shara Bey visiting Naboo. This provides Rucka with a good opportunity to connect some of the strands from the original trilogy and the prequels. Naboo is a peaceful democracy, but it was also the homeworld of the late Emperor. Its people are understandably horrified and ashamed by this, and are quite eager to support Leia’s efforts to organize the New Republic. Unfortunately this possibility was foreseen by Palpatine, and Naboo is one of the planets targeted by Operation: Cinder. Leia, Shara and Soruna, the current queen of Naboo, are forced to pilot decades-old fighter craft in a desperate effort to fight off the orbiting Imperial fleet. The final issue sees Shara joining Luke Skywalker infiltrating an Imperial facility on a rescue mission. The object that they seek to retrieve from the Empire is unusual, to say the least. Well, perhaps that was why Luke only brought along one other person to help him, because he didn’t want to endanger anyone else on what might have been a questionable task. This does give Rucka the opportunity to write an exciting action sequence showing Luke using his full Jedi abilities against a squad of Stormtroopers. There’s another nice sequence Rucka has where he shows the Alliance have learned from past losses. In issue, #2, fighting against the Empire on Sterdic IV, the Rebels are pitted against an Imperial Walker. Obviously remembering their devastating defeat on Hoth, this time the Rebels launch a group of Y-Wings to fly above the AT-AT, dropping clusters of magnetized bombs onto it. Shara: I’ve got a son I’ve barely seen since he was born. A husband I get to see for an hour at a time every couple of weeks, if we’re lucky. I’m tired, and I feel guilty for even saying so. I feel like I’m abandoning the Rebellion. Luke: But if the cost of our struggle is the lives we fought to protect, the future we hoped to see, then what is it we were fighting for? At first I was a bit surprised that Shattered Empire ended without much resolution. Thinking it over, I realized that it did have closure as far as Shara and Kes are concerned. And at its best Star Wars has always been concerned with how the lives of individuals and families unfolded amidst vast galactic events and upheavals. Besides, until The Force Awakens actually begins showing, there is no way to know if Shattered Empire actually does set up any characters or subplots for the new movies. Marco Checchetto, with assists by Angel Unzeta and Emilio Laiso, provides the artwork for this miniseries. Checchetto’s work is very detailed. He also lays out his pages dramatically. Checchetto is definitely well suited to drawing both ground combat and space battles. Checchetto is also good with the quieter, character-driven moments. That’s important, since the relationship between Shara and Kes is a central element of this story. For the most part I found Shattered Empire to be a strong, enjoyable miniseries. Hopefully Marvel and Disney will ask Rucka and Checchetto to return to chronicling the Star Wars universe in the future. As the release of The Force Awakens approaches, I’ve been reviewing a few of my favorite entries in the Star Wars expanded universe. Today I’m looking at River of Chaos, a four issue miniseries published by Dark Horse in 1995. It was written by Louise Simonson and illustrated by June Brigman & Roy Richardson. Six months after the destruction of the first Death Star, ace Imperial pilot Ranulf Trommer is summoned before the high-ranking Grand Moff Lynch. There are rumors that Grigor, the Imperial governor of M’Haeli, is engaged in illegal activity. Lynch assigns Ranulf to be the Governor’s new aide, with orders to report anything suspicious. Before Ranulf can arrive on M’Haeli, one of Grigor’s informants alerts him to the pilot’s secret mission. Seeking to dispose of him, Grigor sends Ranulf to infiltrate the Rebel cell on M’Haeli. The Governor subsequently dispatches Stormtroopers to attack the Rebels, intending for Ranulf to be killed in the crossfire. Posing as a merchant, Ranulf brings a damaged protocol droid to Mora, an 18 year old human mechanic suspected of Rebel activity. When she was only an infant, Mora was orphaned, and she was adopted by Ch’no, one of the H’Drachi, the native inhabitants of M’Haeli. Ch’no has subsequently been ostracized by the rest of his people. Likewise, because she was raised by a H’Drachi, Mora does not feel any real kinship with the human settlers. She is not comfortable in either society. Soon after Ranulf arrives at Mora’s shop, the two are attacked by the Governor’s troops. Ranulf is wounded, and Mora helps him to escape. She brings him to several of her Rebel friends, including the visiting Princess Leia, although they are immediately suspicious of Ranulf. The Rebels discover that Governor Grigor is working with space pirates to run an illegal mining operation on M’Haeli. Ranulf is convinced that once the Governor is arrested, he will be replaced by someone fair & honest, and that the planet will no longer want to join the Rebellion. When it becomes apparent that Ranulf is working for the Empire, the Rebel cell understandably panics, fearing that an attack is imminent. Mora once again feels like an outsider and an outcast as the other Rebels look upon her as a gullible fool who brought a spy into their midst. She also wonders how she could have so misread Ranulf, who she sensed to be a good person. Ranulf, in turn, also begins to experience doubts. Louise Simonson does good work developing the characters in River of Chaos. I really like how she wrote Ranulf and Mora, as well as the supporting cast. One of the things she touches upon is something you occasionally see pondered in fandom, namely just what sort of person would actually work for an organization like the Empire? Obviously, as in real-world totalitarian regimes, you have those with a superiority complex who enjoy wielding authority and who wish to exercise power over others. You also have those who see the excesses of the Empire as an unfortunate necessity in maintaining an ordered society. You then have those who see in a cold, impersonal bureaucracy the opportunity to exploit the system and become wealthy. Finally, there are those who are unable or unwilling to think outside the box, content to blindly follow orders and unquestioningly listen to Imperial propaganda. Ranulf: We used to serve the Old Republic. And now we serve Grand Moff Lynch’s New Order. Doesn’t it matter who we serve and why? Admiral Trommer: You were too young to realize the sewer the Old Republic had become. Grand Moff Lynch took control and changed all that. He is strong, and we will help him keep the peace in any way possible. Later on M’Haeli, away from his fellow Imperial troops and officers, among Mora and the Rebels, Ranulf gradually begins to see the universe through their eyes. He starts to perceive that they have legitimate grievances. Ranulf’s slowly begins to understand that there is little difference between Governor Grigor and Grand Moff Lynch. He start to realize that Grigor subjugated M’Haeli in order to line his own pockets, but that Lynch is also willing to do exactly the same in order to further the cause of the Empire. One of the themes that run through Simonson’s work is family. She explores that here through Mora and Ch’no. In many ways this human teenager and H’Drachi elder are much closer than most daughters and fathers who are united by blood. At the same time, Mora realizes that she needs to have more than just Ch’no. The Rebels become the friends and family Mora never had. You also get the impression that Ranulf is the first person for whom she has ever developed romantic feelings. I like that Simonson has Princess Leia appear as a supporting character. One of my favorite aspects of the EU is that it has enable writers to develop various minor characters from the movies, as well as brand new ones. By having Leia appear in a minor capacity, it connects River of Chaos to the larger narrative of the movies without overshadowing Mora, Ranulf, Ch’no and the rest of Simonson’s characters. The artwork by June Brigman & Roy Richardson is really lovely. I have been a fan of both Simonson and Brigman since the early days of their careers when they co-created Power Pack. It is always nice to when they have the opportunity to reunite on projects such as this one. Brigman and Richardson’s work is very clean, with a cute and charming quality to it. There is a genuine tone of fantasy and wonder to their style and the designs of their characters. At the same time, they do a very good job rendering the established Star Wars elements such as Speeder Bikes and Stormtroopers. Brigman & Richardson are definitely underrated, and I wish that we had the opportunity to see their work in comic books much more often. I think River of Chaos fell somewhat under the radar amidst the rest of the Star Wars releases from Dark Horse, which often featured hyper-detailed and embellished artwork. That’s a shame, because this was a nicely written miniseries with wonderful artwork. The creators did a fine job of exploring and developing the Star Wars universe. It’s well worth searching out. As the release of The Force Awakens approaches, I’ve been reviewing various entries in the vast Star Wars Expanded Universe. 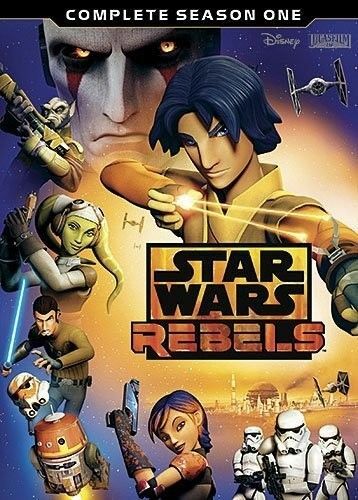 Today I’m looking at a recent piece of Star Wars lore, the first season of the animated TV series Rebels, originally broadcast between October 2014 and March 2015. I picked up the season one DVD last month. Ezra Bridges – The fifteen year old is the figure through whom the audience is introduced to the crew of the Ghost. Ezra’s parents conducted underground anti-Imperial broadcasts on Lothal. They were arrested when Ezra was only eight years old. Spending the next several years as a homeless thief, Ezra comes to the attention of the Ghost crew when he makes off with a supply shipment which they themselves had only just stolen from the Empire. At first motivated solely by survival and self-interest, Ezra joins the Rebels after they risk their lives to rescue him from the Empire. Kanan Jarrus – The leader of the Ghost crew is a former Jedi Padawan who survived the destruction of the Jedi Order during Order 66. Spending the next 15 years in hiding, he became a smuggler and guerilla fighter, keeping his Jedi abilities hidden. Kanan finally unsheathes his lightsaber in a battle to liberate Wookies who have been captured by Imperial slavers. After years of running from his past, Kanan reluctantly re-embraces his Jedi heritage when he realizes that Ezra is a Force sensitive, and he takes on the boy as his apprentice. Sabine Wren – A sarcastic teenage explosive expert and graffiti artist, Sabine is from the planet Mandalore. She was previously enrolled in the Imperial Academy, until an experience there completely embittered her towards the Empire. As a result she developed an aversion to blindly following orders. Kanan has a crush on Sabine, but she has declined to acknowledge it, preferring to remain friends. Garazeb “Zeb” Orrelios – The large, hairy Zeb is one of the last of the Lasat, an alien race who were brutally invaded by the Empire. Seeking to avenge his people, Zeb became involved in the Rebellion. Something of a grumpy hothead, Zeb is less than enthusiastic about Ezra joining the crew, although they eventually develop a grudging mutual respect. Chopper – A beat-up old astromech droid, C1-10P aka Chopper helps keep the Ghost running. Possessing an irritable, mischievous personality, the droid expresses himself through grunts and beeps. Over the course of the first season, the writers do a good job introducing the main characters, spotlighting each of them throughout the 15 episodes. By the time I was finished watching the DVD set, I really did not have a favorite, having grown to like all of them. Kanan: Do, or no not. There is no try. Ezra: What does that even mean? How can I do something if I don’t try to do it? Kanan: Well, see… Actually, that one always confused me, too. But Master Yoda sure used to say it a lot. That was one of my favorite bits from the first season! 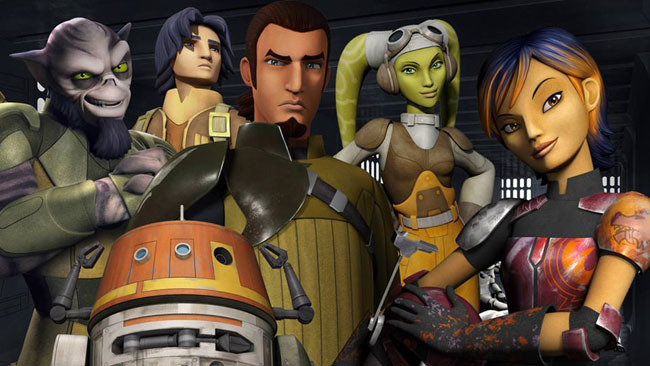 Rebels appears to be geared to a slightly younger audience than the Star Wars movies. There is more of an emphasis on comedy and slapstick, although at times it can also be pretty intense and serious. Some of the humor derives from the fact that the Empire comes across as pretty damn incompetent. Yes, there’s that old joke that Imperial Stormtroopers cannot shoot straight. But if you actually watch the movies, most of the time they are incredibly dangerous adversaries who mow down their enemies left and right. It’s only when they encounter major characters such as Han, Luke or Leia that they are utterly incapable of hitting the broad side of a Jawa sandcrawler. And such is the case with Rebels, where the Ghost crew constantly runs circles around the Empire. You almost get the impression that it’s only sheer force of numbers that’s allowing the Emperor to maintain control of the galaxy! There are exceptions, such as Agent Kallus of the Imperial Security Bureau, who is dangerously competent, but who is constantly frustrated by the bumbling antics of his troops. Likewise the utterly ruthless Grand Moff Tarkin arrives on Lothal late in the season to take charge of operations, and he seems to spend half the time uttering exclamations of exasperation at the people serving under him. The closest thing to a “big bad” for season one is the Imperial Inquisitor, a Force-adept disciple of Darth Vader who utilizes a double bladed lightsaber capable of whirling like a propeller. 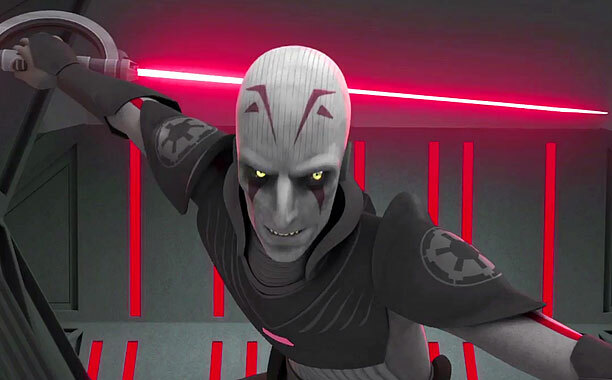 The arrogant, mocking Inquisitor spends much of the season in pursuit of Kanan and Ezra. The design and personality of the Inquisitor is somewhere between Vader and his Sith predecessor Darth Maul. He is definitely a formidable adversary. Several actors from the movies reprise their roles. As always, Anthony Daniels is on hand to voice C-3PO. James Earl Jones returns for his iconic vocalization of Darth Vader, as do Frank Oz as Yoda and Billy Dee Williams as Lando Callrissian. Lando appears in the episode “Idiot’s Array.” Zeb loses Chopper to Lando in a game of Sabacc, much to the droid’s indignation. To get Chopper back, the Ghost crew agrees to help Lando smuggle cargo through the Imperial blockade of Lothal. And, no, the cargo is not a case of Colt 45 (which was my first guess) but so-called “mining equipment,” namely a very odd animal that is a cross between a pig and a puffer fish. This is a few years before Lando became the semi-respectable administrator of Cloud City, back when he was still a smooth-talking gambler and con artist. Williams does a good job recreating the part. “Idiot’s Array” is one of the most offbeat and comedic installments of the entire season. Actually, it’s a great episode, genuinely funny and entertaining. And it actually works out well, coming right before the final four episode arc of the season, a very intense and serious storyline. Season one draws to a dramatic conclusion with “Fire Across the Galaxy.” The crew infiltrates Tarkin’s star destroyer to rescue Kanan. This leads to a final, riveting showdown between Kanan and the Inquisitor. 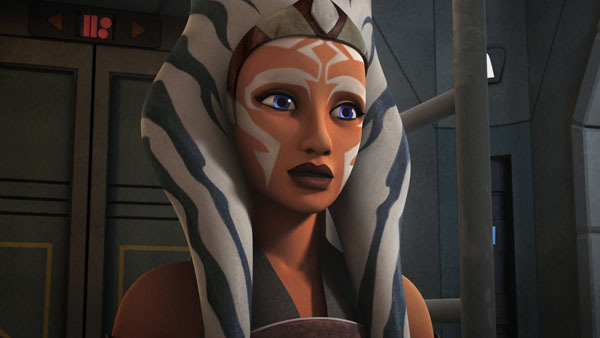 “Fire Across the Galaxy” also reveals the identity of Fulcrum; she is none other than Ahsoka Tano, former Jedi and fan favorite from The Clone Wars animated series. It was a pleasant surprise to learn that Ahsoka survived the Jedi Purge and was working alongside Senator Bail Organa to organize the Rebel Alliance. As “Fire Across the Galaxy” came to a close, I found myself very much looking forward to season two. The first year had done a great job at developing the main characters, and I am interested in seeing Ahsoka becoming a regular. Also, with the arrival of Darth Vader on Lothal in the final scene, the possibility of Ahsoka encountering her former master and learning of his turn to the Dark Side appears to be in the cards. By the way, in watching Rebels season one, I came to realize just how crucial the visual designs of Ralph McQuarrie, the music of John Williams and the sound designs of Ben Burtt all are in recapturing the feel, the atmosphere of the Star Wars universe in an animated series. All of these have been utilized by the makers of Rebels, and it just would not be the same in the absence of any of them. I cancelled cable TV service a while back, but I can always get Rebels season two through iTunes. It’s definitely something I’d rather not have to wait for the DVD release. It’s an entertaining, well-written series that does a great job of exploring the period between the prequels and the original trilogy.